With the Link's Awakening remake freshly revealed, this revelation is all the more relevant. 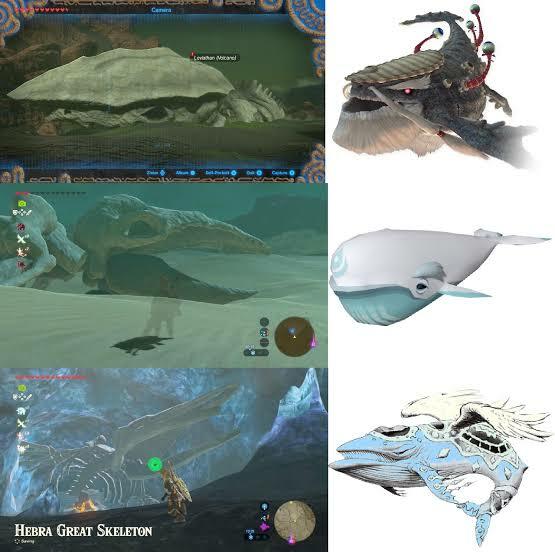 Found on reddit and collected by user Mr_Muckacka, it seems as if the Zelda: Breath of the Wild leviathan bones (read: random skeletons you can find in the overworld) line up with actual characters from previous Zelda games. All three whales are, from top to bottom: Levias (Skyward Sword), the Ocean King (Phantom Hourglass), and the Wind Fish (Link's Awakening). They're found in Death Mountain, the Gerudo desert, and Hebra respectively. With Breath of the Wild officially placed at the end of the timeline (whatever that phrase means these days) it is possible these could be official references, or someone having a laugh with an Easter egg. Either way it's a great observation and another testament to how gigantic and full of life Breath of the World's map is.